This morning we welcomed Mr Howard Newhall from the cancer charity, The Christie Hospital, Manchester, to receive a cheque of £2500, which was raised during the summer term’s fundraising extravaganza – ‘Teach your Teacher’. This saw students teaching their teachers an array of dances which were enjoyed by the whole school on the last day of term. Performances included the staff band, Irish Dancers, Morris Dancers and Kung Fu Fighting. A major highlight and definite crowd pleaser was the Little Mix v One Direction dance off. 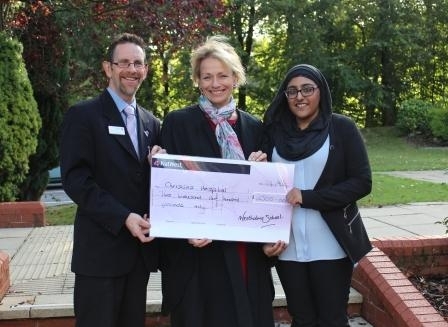 The charity was selected by Sixth Form student, Zainab Khatoon, who was receiving treatment from The Christie Hospital. This charity is now extremely close the hearts of the Westholme Community.